History of the United States. 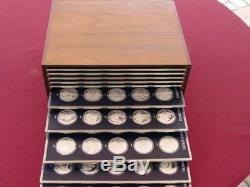 Set of 200 medals housed in trays and case - entire history of U. Number of Items in Set. 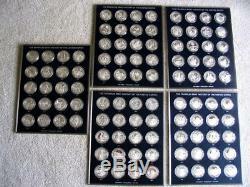 This set contains 10 sheets in a box with 20 medals on each page for a total of 200 medals and 250 troy ounces in weight. Medals show a significant event in history on the front and an explanation is given on the back. This was the largest set offered by the Franklin Mint and it took the longest to complete. The set offered is a complete set. These are stock photos and not photos of the actual item which is the same because this item is under lock and key. This gives you an idea of what the medals look like. The medals are encased in plastic for their protection. One of the trays on the box of this item are slightly warped but work just fine. Display box is a little worn. All medals are encased in plastic and in great shape. The item "Sterling Silver Franklin Mint History of the United States huge set 200 TOZ" is in sale since Monday, September 3, 2018. This item is in the category "Collectibles\Decorative Collectibles\Decorative Collectible Brands\Franklin Mint\Other Franklin Mint". The seller is "goodvictory" and is located in Crescent City, California.